In a classic Annie J. move of seeing an Oscar film when it's no longer speculative who's going to win which awards (by the way, Mad Max was an amazing film and deserved those 6 Oscars, just sayin), I went and saw Carol this past Sunday. To be perfectly honest, I would've much rather have seen Room or Spotlight but as I have no access to OnDemand stuff and I hate watching things on my laptop (stared at Room on iTunes for a good 2 minutes before exiting the program) Carol was what I was working with. Also I love Cate Blanchett and the sets and costumes in this looked incredible. Just look how pretty. LOOK. Therese (Rooney Mara) is just a regular city girl: she works in a department store, she has a boyfriend, and she isn't really anything special. But all of that changes when Carol Aird walks into the toy department where she's working. After asking for Therese's advice on a Christmas gift for her daughter, Carol leaves her gloves on the counter. Womp womp. But Therese tracks down her address and sends them back to her. To say thank you, Carol invites her out to lunch. (This isn't central to the plot but I must make a note of this: they eat poached eggs with creamed spinach -- is that not the most 1950s meal you could ever imagine? Anyway..) Things start to get a little out of the ordinary, though, when Carol keeps on pressing Therese to meet with her -- though Therese is more than happy to oblige. Going to her house, asking if she can go to hers, etc. And they start to get to know each other. The whole time this is happening, Carol is going through a messy divorce with her husband, Harge (Kyle Chandler), who's aware that she's dated women in the past and isn't thrilled about her fling with Therese. The rest of the movie follows the two women as they begin to understand each other and as their romances comes up against the expectations of a 1950s society. Spoiler alert: 1950s society isn't thrilled. First of all: this movie is gorgeous. The colors are rich, the setting is spot-on, and the costumes are beautiful. And the whole feel of the movie comes to life under the cinematography of Edward Lachman, who also did The Virgin Suicides and, most noteworthy as of late, HBO's mini-series Mildred Pierce. 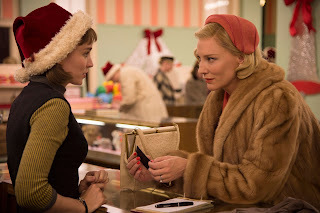 Under his eye, there's a beautiful mixing of the real-life, wintry and cold-bright New York City and the muted tones of the softly lit interiors where Carol and Therese get to speak to one another one-on-one. Interesting perspectives make this too, as we look out of a foggy window in a cab, hover outside an apartment building as youth party inside, and hear a lot of off-screen dialogue while the camera meanders to show us where it's coming from. Where I ran into trouble with this film was in the acting. While Carol seems to be attempting to live her life the way that she wants, and that's reflected very well in Cate Blanchett's portrayal of the character I think, there's a wooden quality to Therese that I had a hard time sympathizing with for most of the movie. While Carol is treading carefully, there's a certainty to her actions that makes them unmistakeable. Therese, however, is more watery, happy to float along in Carol's wake while somewhat lacking in her own personality. As a result, I found their chemistry a little hard to believe. 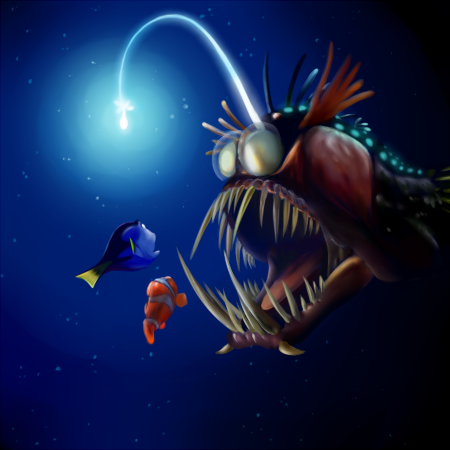 Therese seems entranced by Carol and befuddled by her own actions, like a minnow bewitched by the light of an anglerfish. I will say, though, that what plays out well is the movie's tone. There is an air of caution to everything that they do, which I think reflects the attitudes of the era pretty well. It isn't an exploitation film that centers on how repressed desire plays out in the bedroom (please see: Blue is the Warmest Color). Rather, it contemplates how cautious 1950s queer women had to have been to make advances towards other women, even when you knew they were interested too. The muted tone here is very well done. I just wish there'd been a little less caution and a little more chemistry. Especially when they're alone. Natural chemistry is finding easy conversation and laughter, and I found that to be absent here. 7.5 outa 10. Long story short: Beautiful movie, but a little self-contained, even for the era that it's presenting to the audience. I was very underwhelmed by both the book and the movie. It's beautifully shot like you said, but I just found everything to be quite dull. I wasn't one that was mad it didn't get a Best Pic nomination. It's just very subdued, which I'm sure is on purpose given the time, but I hate when characters are supposed to be in love and don't talk, laugh, or goof around with each other. It makes it feel so solemn and weird. And to be perfectly honest, I don't think Rooney Mara is a spectacular actress. Most of the things I've seen her in, her characters are a bit one-dimensional.